Our favorite cilantro lime rice makes this burrito a lunch time go-to. 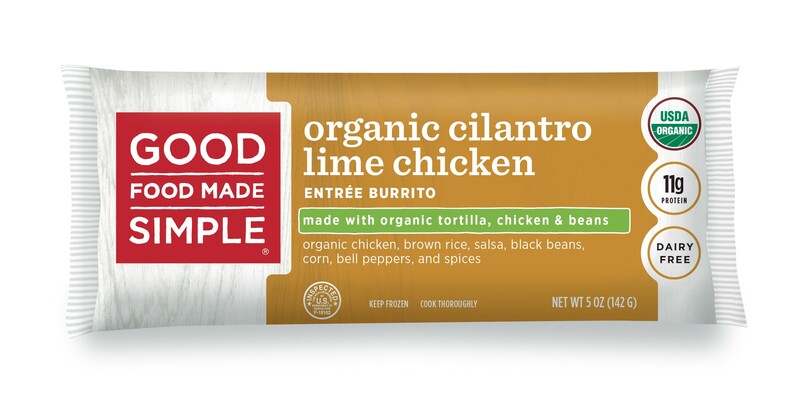 Tender, organic chicken wrapped in an organic tortilla with organic brown rice, organic salsa, organic black beans, organic corn, organic bell peppers, and organic lime juice. (ORGANIC DICED TOMATOES, DICED ORGANIC ONIONS, ORGANIC VINEGAR, ORGANIC LIME JUICE, DICED ORGANIC JALAPEÑOS, ORGANIC SCALLIONS, SEA SALT, ORGANIC GARLIC POWDER, ORGANIC CILANTRO, ORGANIC CUMIN, ORGANIC BLACK PEPPER, ORGANIC CORIANDER, ORGANIC CHILI PEPPER, ORGANIC CORN STARCH), ORGANIC BLACK BEANS, ORGANIC SUPER SWEET CORN, ORGANIC RED PEPPERS, ORGANIC LIME JUICE (ORGANIC LIME JUICE CONCENTRATE AND WATER), ORGANIC CORN STARCH, ORGANIC CILANTRO, ORGANIC SOUTHWESTERN SEASONING (ORGANIC SPICES, SALT, ORGANIC ONION AND GARLIC POWDER, ORGANIC RICE CONCENTRATE, AND EXTRACTIVE OF PAPRIKA).